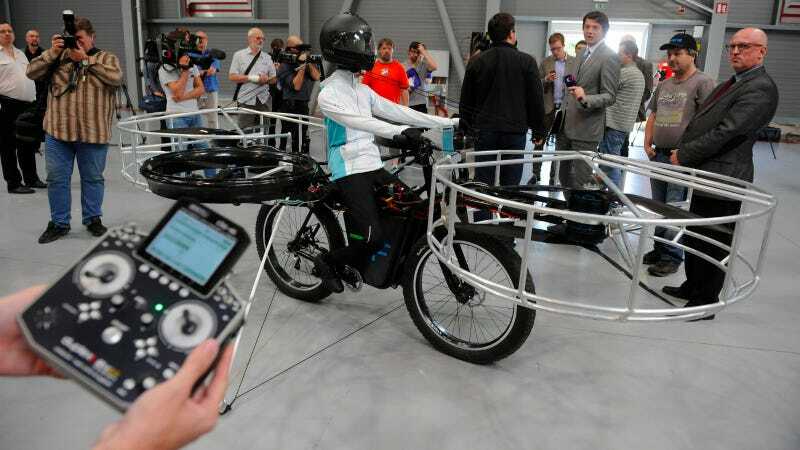 OK, so none of us probably have any use for a flying bike, but it's alright to want one. It's perfectly natural. So just let the wild envy wash over you as this Frankenstein machine takes flight. Developed by three Czech companies working in unison, the bike was demoed for the first time in Prague today, where it underwent a remote-controlled five-minute flight. The 209-pound rig with its four battery-powered propeller pods isn't quite capable of carrying around a real human being yet, so instead a dummy got the inaugural ride. Hope he enjoyed it.